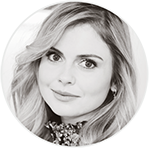 In a recent Instagram post (June 2016), Rose McIver told us that she finished her screenplay and it was definitely time for her to go back to New Zealand. We now know that she was working on a screenplay for producer Peter Salmon, who now lives in Australia. Rose explains that she WILL NOT PLAY in this project, but that it’s something she has written AS A WRITER. Especially considering McIver put the final touches on a screenplay a week earlier. “I’m very excited — it’s with a director who actually lives in Australia now, Peter Salmon so it’s sitting in his inbox, waiting to be read,” she reveals.